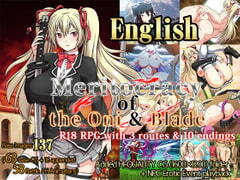 User reviews for "Meritocracy of the Oni & Blade + Append [Complete Edition / Multi-Language]"
If you've played Marauder of Dystopia (Killing Time), Dark Elf Historia, or Botsuraku Reijyo (The Heiress), expect more of the same type of gameplay / game / branches / art but with some Refinements. I might be dreaming it but the battle animations feel a lot more fluid, the resolution might've gotten a boost since the prior games, and lastly the two vocal tracks in the soundtrack really show the care in the production. They are simply great and grounds alone to get it. Biggest gripe I'd say on the anthology I'd say is sometimes the dungeons/etc seem a bit long and if you're going for 7/10 endings you will need to play through the game at least 3 times. Some dungeons feel recycled from the other titles as well but I can't vouch for certainty. I suppose it's fine if they're cutting this corner to channel work into everything else which really shines, but if you're not a fan of the avoid monsters run which most of the levels consist of, you'll have to bear with it a lot. It'd be cool if more cutscenes were able to skip like the h scenes to reflect that, maybe some dialogue to be a bit lengthier than needed, but some of this might come down to translation and pacing so some of the avoidable may be indeed unavoidable. Can't say for sure. All in all DLSite / 111 should be very proud of this one. For some reason this title isn't in their circle list. Play this one for the story / production / vocal tracks. I didn't go over the story much, but goes into comedy many times, serious at others. No spoilers, you should grab this game and enjoy.